« Worldwide Live Broadcast for Tackitt! Mike Trahan only gets excited when something really exciting happens. That Sunday night when he messaged me directly, excitedly asking if I was around, told me that it was something big…. It was a review. Not just ANY review… A REAL REVIEW! It was one of those reviews that tells you your work is making the splash you hoped for. “Wait until you read this– I got it from my high school friend, Bonetta Adams Smith, a few minutes ago,” Mike explained excitedly”. This was my reply to her: Bonetta, I am so happy to hear you say that. I didn’t want it to be about ME, I wanted it to be about them and my experiences. I am so relieved you read it that way.” Bonetta hit on something that I was hoping would happenand I want to stress the point, Nick, She said, “I never really feel that the whole book is about you — because it involves so many others that played a role in your life”. That is just what I wanted the reader to feel, Nick. I didn’t want it to be about ME.I wanted to acknowledge the people who were part of my life an were instrumental in what happened to me along the way. 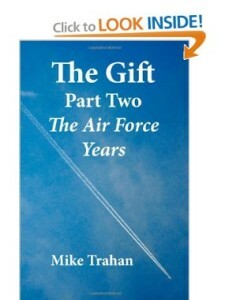 Get your copy of “The Gift Part Two: The Airforce Years” right here!